So your probably clueless. What in the world is this about. Again, another great project from my son's kindergarten teacher. It is a great activity to help children learn positions and the words associated with them. From looking at her materials, it looks like it is from The Mailbox Kindergarten series 1998--are we showing our age? Oh no, he's on the go! My son performed the song for me. Wiggle moves around with the song. He's on the head, he's behind the knee, and he's under the arm. I'm sure you can probably come with some more too. 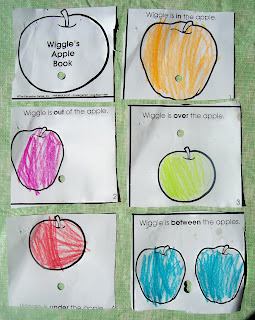 There was also a little book that cam home called Wiggle's Apple Book. 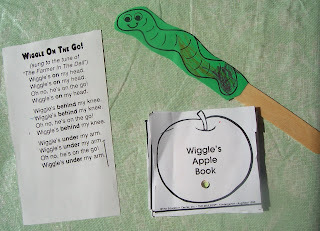 Each page of the book had a hole punched in it where it read that Wiggle was. My son has "read" this book to me about 5 times in the last 2 days. (The book was stapled together, I unstapled it so you could see thepages.) He got a great kick out of the activity. I hope your children do too. We did a similar activity with a poem called I like Stars. Each set of stars was a different color so the children were "reading" the poem by using the color and repetition cues.